Last night, I had the privilege of attending the first-ever Chicago Iron Bartender Competition. The event was held at Le Passage, which is undergoing a very exciting transformation right now (more on that later). I knew it was going to be a great experience when I walked up to the bar and found myself standing next to Dale DeGroff, King Cocktail himself. And he was handing me a drink, after he had just confirmed with the bartenders that the recipe was as he intended (he had developed it for the event). It was great, of course - rum, fresh kiwi, coconut syrup and a splash of coconut milk. Twelve finalists battled it out and created an amazing array of cocktails, but only one could be crowned Chicago's first Iron Bartender. We have some amazing bartenders in the Chicago area, and this was a great opportunity to see them all in action, all in one place. With Dale and Tony Abou-Ganim on hand to emcee, I knew I was in a room full of some of the best mixologists in the U.S.
Each competitor had a few minutes to scout out the available ingredients before the event began. 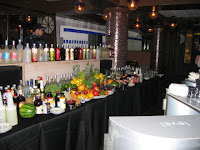 The bar was stocked with a variety of fruits, juices, spices and other potential ingredients. However, none of the competitors was able to make the recipe submitted to the contest initially - everyone was missing at least one critical ingredient. Instead, they were forced to modify their recipe or make an entirely new drink on the fly. In Round One, the competition was fierce, with our good friend Tim of Spring Restaurant Group challenging John from MK, Angie of Ultimate Elixirs, and Wilber of Bice. The competitors in Round Two included Peter from Sepia, Radostin from the Doubletree Oak Brook, Debbi from The Drawing Room at Le Passage, and Tony from Jilly's Naperville. Round Three featured Charles from Three Headed Productions, James from Otom Restaurant, Adam of Nacional 27 and Enrique from Martini Park. Each successive round was more tense than the prior one, and all twelve drinks were very impressive. They covered the entire range of the cocktail spectrum, from the very light to the very rich, from the aperitif to dessert in a glass. It was tough night for the judging panel, which included Bridget Albert, Francesco Lafranconi and Simon Ford from Absolut/Plymouth Gin. In fact, we even had one tie during the rounds. After the initial rounds, Charles, Peter and John advanced to the final round. One more round of drinks later (where all three chose to make another new drink rather than repeating their earlier creation), Peter V. of Sepia was crowned Chicago's Iron Bartender. Congratulations to Peter, and to all of the competitors - it was a fantastic event, and a whole lot of fun to watch. Does a White Lady Require Egg White? We recently had cocktails at The Violet Hour in Chicago, and we had some fantastic conversations with the people sitting next to us at the bar. In one of them, our new friend told us that his recipe for the White Lady requires egg white. We'd never put egg white into the drink before, and being the curious sort, I decided to research this a bit and potentially give it a try. This is an old drink, popular since at least the 1930's. It seems that two people are often credited with creating this drink, both of them named Harry. The first published instance of the recipe seems to be the Savoy Cocktail Book by Harry Craddock (1930), who was in London at the American Bar at the time. However, Harry MacElhone is also often credited with the drink, reputedly making the drink as early as 1919, albeit with créme de menthe rather than gin. He later perfected it at Harry's New York Bar in Paris in the late 1920's or early 1930's (although their website claims 1919 as the creation date). Unfortunately we'll probably never know which story is right, perhaps they both are - its certainly not unheard of for people to separately develop very similar cocktails. No egg white (and certainly no créme de menthe). The egg white is an interesting variation, it adds a creaminess and totally changes the texture of the drink (as it does with any cocktail it visits). With equal parts of the ingredients, or with the original Savoy recipe, I liked the egg white variation - it cut the bite of the lemon a bit, but still left the rest of the flavors intact. Half an egg white was enough for me, though - more than that and I started to taste the egg white and get that teeth coating thing happening. In the end, I think I like the original Savoy recipe best, although I found the variations interesting. I imagine this is yet another case where personal preference decides the best recipe. Just for fun, when I was back at the Violet Hour tonight, I asked the bartender, Michael (photo at left), how he makes his White Lady. He laughed for a second, and said he hasn't made that drink since about 1974 (bear in mind he's only about 30, 35 tops), and that the last person who ordered it was a 60-year old Englishman. However, he said he definitely didn't use any egg white when he made it. He found it very entertaining that a discussion about it (which inspired my blog post) took place at his bar, though! This weekend, I found myself on the road in southern Illinois (I know, you're jealous). 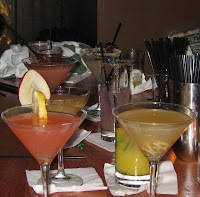 It was a bit harder to find a great cocktail, but I did manage to find a couple of great bars in Champaign-Urbana. In one of my stops, I revisited one of my favorite drinks, the Negroni, and was reminded of some great variations on it that I've had in recent months. Now the Negroni is the Negroni, and pretty much every single bartending book I consulted has the same recipe. Maybe I should just leave it as it is, but I like playing around with recipes and seeing what others have done with it as well. Traditionally, it would be served on the rocks (and stirred gently), but it can also be served in a cocktail glass after shaking with ice. The traditional garnish would be a slice of orange or an orange twist (you could even flame it if you wanted). Legend has it that the Negroni was named for Count Negroni, who often ordered it at a bar in Italy, initially as an Americano with gin added. The Americans were already loving the Americano drink, so they also adopted the Negroni and some brought it home with them. The drink is intended as a pre-dinner drink, an aperitif, to stimulate the appetite. 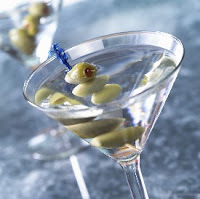 You have a choice in gin, and vermouth, and those will affect the final drink. Sweet vermouths can vary quite a lot in flavor, spice and sweetness, so the balance with the Campari can vary quite a bit. You could also adjust the proportions, which I have been known to do (sometimes the Campari is just a bit too much for me in the original proportions, so I'll tone it down just a bit, or I might add a dash extra). And, if you are OK with bucking tradition, you could substitute another spirit for the Campari. Served up, and garnished with an orange twist. The Aperol is a bitter, but not as bitter as Campari, and its flavor profile is a bit different (sweet orange rather than spice). It blends particularly nicely with the Vya sweet vermouth - I have consistently been impressed with the combination. It has a lovely balance of flavors, each making itself known, rather than one dominating the drink. Anyone have a favorite Negroni recipe other than the original? Since I didn't have to go to class today, we decided to conduct our taste test of Q Tonic. All of us were excited to try this new tonic, which we had heard and read about but not tasted. We decided to compare it to the other tonics we have on hand, Fever Tree, Stirrings and the ubiquitous Schweppes. We have a special guest with us today, my father-in-law, so we had 4 people on our tasting panel this time. As before, we tried the tonics on their own, with our vodka and with our Distiller's Gin No. 6 (of course). Our reviews of Q were mixed. We all liked it with the vodka, but most of us (3 out of 4) did not like it with the gin - it seemed to bury the gin too much and created some off notes on the palate. On its own, it is fresh tasting and light, with a moderate amount of quinine (Schweppes has more). All of us still really liked the Fever Tree, and we found that when we adjusted the proportions, we could get a bit more of the gin to shine through. It was very fresh tasting, complex and not too sweet. It seems to have a bit more quinine than Q. Everyone ranked it 1st or 2nd with both the vodka and the gin. With the Stirrings, one of us felt it was too sweet and therefore did not like it. However, two of us liked it best of all the tonics with the gin, loving its fresh citrus notes and its pairing with the gin. The Stirrings was the sweetest of the bunch, and was light on the quinine. None of us picked the Schweppes as the best. We did like it better than other major market brands when we tried it before, but we like these new brands better. Please chime in if you have any tonic experiences to share! A few posts ago, I talked about the Academy of Fine Spirits, and I thought I would give a quick update on the class. Last week, we had our infusion contest judging - each of us was given a large Ball jar and some vodka, and an array of ingredients to select from. We had to infuse our vodka for two weeks, and then bring it back to the class. During the two weeks, we were not allowed to add or take away any ingredients, but we could place the jar in different temperature and light settings, as desired. Well, I didn't win the contest (Cara B. from Weber Grill Restaurant was the winner - congrats Cara!). Cara's infusion was fruit-focused, with mango, berries and pineapple. I had tried for a savory infusion, with cucumber, rosemary, cardamom and a bit of red pear. If I could have removed the cardamom and rosemary earlier, it might've been OK - since I couldn't, it was mostly a cardamom infusion with a bit of rosemary. It was interesting to see what others put into the jar, and what came out on the other side - it was a great supplement to the experimentation I've already been doing. Its much easier when you can adjust the process and ingredients throughout the infusion! In tequila, the age statement refers to an average age of the tequilas blended to make that batch. In scotch and rum, it refers to the youngest spirit in the blend. The term "single malt" can be used on a scotch made at a single distillery. It doesn't have to be from a single malting or even a single year, just all from one distillery. There are so many rules for each type of spirit, its interesting (and we're only scratching the surface in this class). I've become extremely familiar with the rules for the products we make, but less so for other types of spirits. Its interesting to see what is and isn't required, etc. and where the distiller has flexibility and where he or she doesn't have any. Hopefully I'll retain what I've learned for the midterm next week! Muddle mint in an old fashioned glass with lime and syrup. Just a few presses with the muddler, don't grind it into submission. Add crushed ice, rum and top with soda. Garnish with mint sprig. On our last day in San Fran, we went to one more great cocktail bar that had been recommended to us by several sources (including a few attendees at the Independent Spirit Fest). The reports we'd received were that this bar has a daytime cocktail menu and a nighttime menu that only comes out after sunset. Intrigued by this idea, and the fact that we knew they were making great drinks, we headed out to its neighborhood, the Haight. 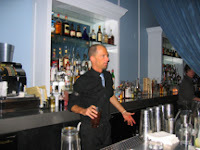 We arrived around 12:30 pm at The Alembic, and were greeted by Josey Packard, the bartender/mixologist on duty. Josey swiftly gave us menus and told us a bit about the place, and we set about deciding what to have. The vast array of truly unique spirits behind the bar was awe inspiring, so we tried to focus on the drink list. All the cocktails were great, but my fave was the Pearly Gates (which we later learned was one of Josey's creations, hence the photo of her and the drink above!). As I get older, I am developing more of a taste for anise, so the hint of it from the mystery ingredient was great in this drink. I'll have to see if I can get Josey to give me that recipe! Unfortunately we had to leave to catch our plane, or we could've easily stayed until the nighttime menu came out and talk more with Josey. We even got to try some Old Tom gin there, as well as some other spirits we've not seen before - it was great! Creme de Violette - An Unknown (but Excellent) Brand? In the last couple of months, I've seen a few blogs and articles about Creme de Violette, a required ingredient for a number of drinks in the Savoy Cocktail Book and other classic cocktails. A new brand of Creme de Violette has started appearing in the U.S, Rothman & Winter, imported by the folks at Haus Alpenz. While we weren't able to locate a bottle of the Rothman & Winter in SF (and we've not seen any here in Chicago), we did manage to get a taste of it at Absinthe (yet another great cocktail bar we visited in SF). It was nice, but I must say it is not as good as the one we've regularly been buying in Chicago. Of course, we can only find it at one store in Chicago (Sam's Wine & Spirits in Lincoln Park), and they are sometimes out of it, because those of us in the know buy it up and the company that imports it doesn't come to town very often, but it is exceptional. 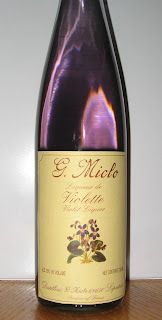 It's made by G. Miclo in France, and is imported by a very small import company. It has a delicate yet complex violet flavor that lingers, and is not overwhelmingly sweet. Anyone else tried this violet liqueur or the Hermes version (or another one)? What did you think? How did it compare to the Rothman & Winter? One of our favorite meals in San Fran was at Nopa. The place came highly recommended from our new friend Gabrielle at Bourbon and Branch (another great cocktail bar we had visited on Friday night), and boy was she right. We arrived around 11 pm Saturday night, and we sat at the bar. 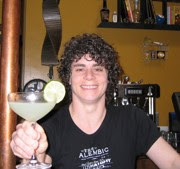 Shortly after arriving, we met Neyah White (-->), the fantastic mixologist behind many of their libations. We tried a couple of cocktails at Nopa, including The Last Word (Green Chartreuse, gin, maraschino and lime), as well as a classic Sazerac (with Wild Turkey) - both were very good. We then moved on to searching the bar for bottles of things we had not seen before (one of our favorite pastimes, especially when traveling). I tried a bourbon called Hancock's Reserve that was very nice, and made by the fine folks at Buffalo Trace. Derek ordered a classic Manhattan, and Neyah introduced us to a new vermouth - Carpano Antica. It was fantastic. We tried some homemade bitters (loved the Sunshine bitters with saffron & cardamom) and talked about other classic cocktails with Neyah and Paul, the very nice gentleman sitting next to us. 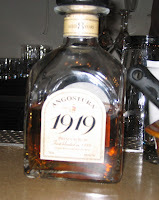 With our dessert (an intriguing warm apple & cheddar crisp with reggiano gelato), Neyah poured a Angostura 1919 rum, which we had also never seen before (why don't we have those in Chicago?). One thing I realized is that we really do need to travel more and see what's happening in the cocktail culture outside of Chicago. There are amazing flavors, products and cocktails that haven't made their way here yet! Unfortunately our journey home was a bit rough, but we made it... we're tired! More coming soon! We've been serving a lot of gimlets the last few weeks, I think its perhaps due to the unseasonably hot weather we've been having in Chicago recently. We often tinker with the recipe, but we almost never use lime cordial. Of course a few bartender friends have told me that its not really a Gimlet if you don't use Rose's lime, but I've not bought into that. Given all this sipping and discussing, I wondered about the history of the gimlet. Thankfully, a quick perusal of a few of my trusty cocktail books gave me the lowdown. According to Gary Regan's The Joy of Mixology (p. 261), It seems the Gimlet was originally called the Gimlette, and was named after the naval surgeon who created the drink as a means to give lime juice to sailors for the prevention of scurvy. According to the Field Guide to Cocktails by Rob Chirico (p. 119), Dr. Gimette thought that gin alone might cloud the sailors' minds, and adding lime juice to it would prevent that (hmm...). iAccording to Wikipedia, Lauchlin Rose (hence the name Rose's) invented lime cordial in the 1860's. Mr. Rose patented a method to preserve citrus juice that did not require alcohol, and the British Royal Navy was at that time required to provide a daily lime ration to sailors (hence the term "limey"). A lime cordial ration + gin = happy sailors who don't get scurvy (or so they thought then). If you go into most bars today and order a gimlet, you'll probably get vodka not gin, and you'll definitely get Rose's lime (or an impersonator). The actual recipe varies widely depending on your preferred source - some say equal parts gin & Rose's, some say 3:1 gin to Rose's, etc. 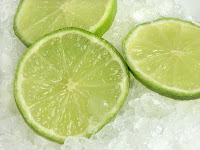 We vary the ingredients based on the lime juice, how sweet we want it to be, and mood. 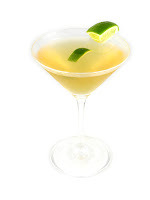 Our current favorite variation is to use ginger-infused simple and call it a Ginger Gimlet. Apparently there is a scene in the movie The Long Goodbye where a statement is made about a Gimlet only being made with Rose's, and since then this is a widely held belief. In fact, at least one of my cocktail books says that if you don't use Rose's and instead use fresh lime juice, you're making a Gin Rickey instead. But a Gin Rickey isn't sweetened if you're making it right, so that doesn't make sense to me. Rose's is, after all, sweetened lime juice (very sweetened) with some other stuff. So if I just use another form of sweetener and lime juice, isn't that just a recipe variation? Clearly, that's my vote! However I have been looking up recipes for homemade lime cordial, so I think I'll give that a try too. Look for a future post on that, and please post a comment if you've made one! This Saturday night, we're participating in a very special event at the W Hotel in San Francisco. Its the first-ever Independent Spirits Fest, where a number of small, independent distilleries (and one or two bigger ones that snuck in) will be gathering together to introduce their products to consumers. We're hoping to get a chance to meet some of the real pioneers in the craft distilling movement, as well as get to taste some innovative products that haven't found their way to Chicago just yet. Plus we'll get to meet some really fun spirits fans and tell them about what we're doing. Its such an exciting time to be making craft spirits, so many interesting things to come! The industry has been dominated by big, big players for so long, perhaps we'll eventually make a small dent in the market like the micro breweries have done. Anyone going to the Fest? Have you tried the new tonic waters? Although for some, fall marks the end of G&T (or V&T) season, I occasionally whip out the tonic water in the fall and winter when I'm in the mood for a crisp, bubbly drink. For a long time, there haven't been many options for tonic water - mostly Schweppes, Canada Dry and some private label brands (and that's still what you'll find at most stores). This summer, we found two new tonic waters in Chicago - Fever Tree and Stirrings. We also heard rumors about Q Tonic coming here, but we've not seen it yet (their website says we can ask for it at our local Whole Foods). We had a staff meeting (all 3 of us) earlier this summer to taste these new tonics with the big brands, as well as another older one we found and hadn't seen before (White Rock). Each of us had our favorites, but the White Rock and Fever Tree scored well with all of us. We’d definitely recommend conducting your own tonic experiments – you might be surprised by the results! Do you have a favorite tonic that I've not mentioned, or have you tried Fever Tree, White Rock or Q Tonic? If so, what did you think? It took me two months to get any info from the White Rock people, so I'm thinking it isn't very available out there. If you're a fan of interesting tonic waters, one of our favorite restaurants (and beverage gurus) has started serving their own house-made tonic water. If you haven't been there already, you should go to Custom House and try Tim Lacey's tonic water (and the other amazing cocktails you'll find). Earlier this week, we attended an event at Intelligentsia Coffee's roasting facility to taste and hear about an extraordinarily expensive coffee, the Geisha coffee from Hacienda La Esmeralda in Panama. Ten bags of it were deemed to be the very best coffee in Panama and were purchased for $130 a pound earlier this year at auction. A buying group of coffee roasters purchased the lot, and some of it went to Intelligentsia. To celebrate the acquisition and continue their quest to promote fine coffee, they invited friends and interested members of the public to come and taste the coffee. For $25 each, we received a 1/4 lb bag of La Esmeralda Geisha coffee (not from the auction lot though), and we got to try the auction lot coffee, brewed through Intelligentsia's Clover coffee machine. We also got to hear about coffee from Geoff Watts of Intelligentsia and Daniel Peterson from Hacienda La Esmeralda - two men who are obviously passionate about what they do. At first, we weren't sure about it... we tasted citrus notes, and it smelled very floral in the bag (I snuck a sniff of the bag of beans)... But we were tasting it in isolation, and weren't sure what to make of it. A little disclaimer: while we are adventurous coffee drinkers, always seeking out something new and exploring the different regions, we're still learning about fine coffees. The fine folks at Intelligentsia then put out some other coffees, and that really helped us in experiencing the Geisha coffee. Geoff and Daniel talked about the coffee and about why its so special. Geoff also suggested that the best way to taste coffees is next to each other, so you can compare and contrast the flavors. He was so right! When we tried the La Esmeralda Geisha next to their Ethiopian Yirgacheffe (the coffee style it is most similar to, Geoff said), we could really see the differences. The Geisha was delicate, complex, citrusy and floral in comparison. The Yirgacheffe was nice too, but not nearly as complex or nuanced. This fall, I am taking a course called the Academy of Spirits and Fine Service. Its a great class so far - each week, we're exploring a different spirit family (tequila, whisk(e)y and rum done! 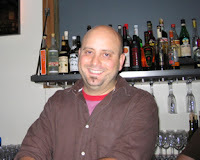 ), and talking about bartending technique and recipe development along the way. We taste, compare & contrast, mix and discuss. I must admit it feels slightly weird/subversive for me to be in this class, since it is held at Southern Wine & Spirits headquarters and led by an employee of Southern. For those who may not be aware, Southern is the largest wine & spirits distributor in the U.S., and they work primarily with very large brands & companies (Absolut, Patron, etc.). At our distillery, we were our own distributor initially, and now work with a small distributor, so in comparison these are the behemoths of our industry. They have been gracious about it, and it certainly helps that the Southern employee happens to be one of the best mixologists in the country (Bridget Albert). So how did I find this course & why am I taking it? Its a prerequisite to joining the Illinois chapter of the U.S. Bartending Guild. The guild's mission is to promote and further the profession of bartending, and they provide a range of opportunities for members to challenge themselves and their skills. Everyone I've met from the guild has been phenomenal and very passionate about their craft - so of course I want to be a part of it! Shake and strain into a chilled cocktail glass. Garnish with lime wedge. Why is this interesting? Its the precursor to the Cosmopolitan. This drink is from 1956, and was promoted by the Ocean Spray company (actually printed on a bottle of juice, believe it or not - just try to do that in today's world)! Muddle sugar cube & bitters; add whiskey and shake with ice. Rinse rocks glass with Pernod, pour off excess. Add ice, then strain shaken mixture into glass. Garnish with a long lemon twist. Why is this interesting? It may have been America's first cocktail - it was created in New Orleans around 1859. I'm very excited to launch this blog! As an avid cocktail fanatic and the founder of a small distillery, I've been exposed to a wide range of spirits and cocktails (and to much about the spirits and alcoholic beverage industry). I've also been learning about coffee, tea and other beverages over the years, so my intention is to explore a variety of drinks topics through this blog. We'll look at classic cocktail recipes and variations, as well as new recipes and drinks. Sometimes I might write about spirits industry topics, or other fun stuff that I come across. Although I'm coming at this from a particular viewpoint, my goal is to be objective, informative and fun. I hope you'll enjoy exploring the world of drinks with me! In my first official post (coming very soon), I'll talk a bit about the bartending course I'm currently taking, and about the US Bartenders Guild (which I am planning to join - the course is a prerequisite). Of course there will be at least one recipe for you to try... See you again soon!